In the modern world of digital photography today, the sheer volume of photographs shot, uploaded and shared on the internet and social network services are exponentially huge and wide. Although we “consume” a lot of photographs, whether you are a leisure, hobbyist, enthusiast or professional photographer, we are not printing as much photographs as before during the analogue/film days. Coming from the film photography era where I started my photography learning and journey, there were no digital cameras and we had to print out our photographs. That was lost with me for a period of time until I started to explore printing photographs more seriously again in 2014 after returning from my Hokkaido trip that inspired me to produce and print my own photography book! I shared a photography article on “Why we should go back to printing photographs” in 2015, I hope that my personal sharing would inspire photographers to start exploring printing photographs again! Canon views the photography printing segment as an integral part of their eco-system, from the input (taking photos with cameras) to the output (printing phots). During my visit to Canon EXPO 2016 Shanghai, I learned more about Canon’s next Wave and Trends, with printing being an integral part of Canon’s solutions and provisions to make them have a holistic eco-system for photographers. From the top end, professional photography printers to home use office/photography printers, right now, Canon has launched a new Canon Mini Photo Printer that would ideally suit both leisure and serious photographers, for daily usage and travel! The Canon Mini Photo printer harnesses ZINK Zero Ink™ Technology, a revolutionary dry-printing technology that enables printing in colour without the use of ink cartridges. The glossy photo prints are smudge-proof and scratch-resistant, with a peel-and-stick reverse side that adheres effortlessly to the back of smartphones, laptops, or just about any smooth surface. Weighing a mere 160g, the Canon Mini Photo Printer is light and compact enough to fit into most pockets, purses, and jackets easily. 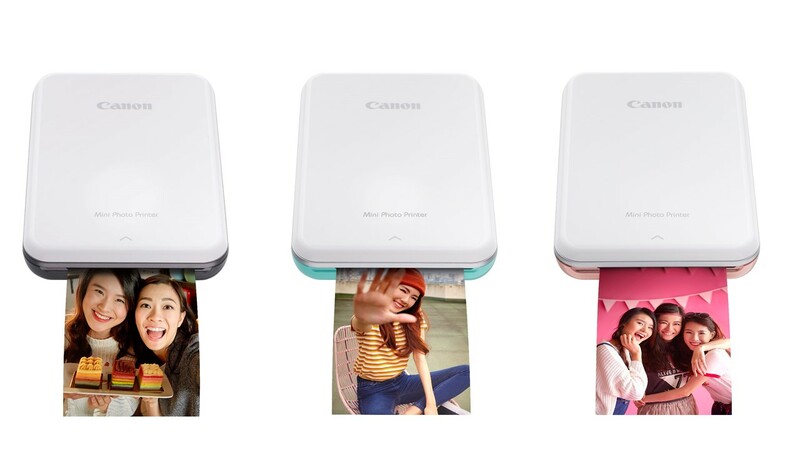 Designed with a built-in battery, the Canon Mini Photo Printer will print up to 20 photos when fully charged. Printing photos from a smartphone is a breeze as users can simply activate Bluetooth pairing with a button located at the side of the Canon Mini Photo Printer. Through the Canon Mini Print app, users can explore endless creative possibilities. Featuring an extensive library of photo-editing tools, creative filters, photo frames, creative stamps, and text boxes, users can add a personal touch to enhance snapshots. To up the fun factor, there are also options such as augmented reality (AR), face distortion and image doodling right before printing. Users can either snap a photo through the in-app camera or retrieve the photos from a variety of online platforms, such as Facebook, Instagram, Google Drive, and Dropbox. Beyond the 2” x 3” print, there are options to create collage prints of up to four images, and even a tile print feature which allows you to split a single image into four or nine prints to create your personalised jigsaw puzzle. With every purchase of the Canon Mini Photo Printer, you will be entitled to a special bundle of Tokidoki premiums, which includes a special edition Tokidoki pouch, lanyard, charm and printer body stickers. In addition, from now till 31 December 2018, take home a special edition Tokidoki denim tote bag. The special edition Tokidoki bundle and denim tote bag are valued at $98. The Canon Mini Photo Printer is now available at all Canon authorized dealers. Mini Photo Print app is free for download on the Apple App Store and Google Play Store and is compatible with Android 5.1 and iOS 10, as well as updates that follow.